7-9pm 20 April 2017 at aceartinc. For those who have a great urge to experiment in an indeterminate and loose session of layering, obliterating, spraying, slopping, moving paint (and other things) on a surface, this workshop will provide the facility, materials and casual / open ended guidance to create a ‘quick and dirty’ work. An original painting will provide the back drop for participants to create their own work; suggestions and ideas shared should either be taken in or negated completely. 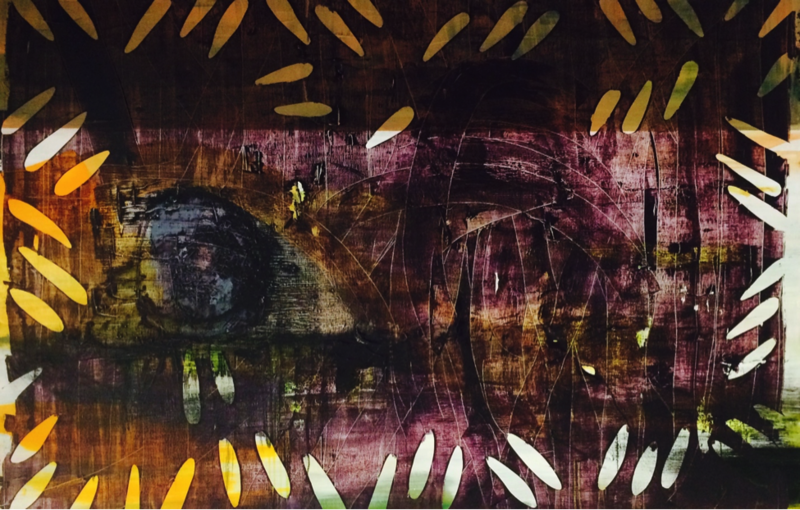 The workshop will reveal that the painting process is on-going, emergent, and in this instance, non-resolute. Please email cartae@aceart.ca to register, space is limited. Workshop is free, donations to Cartae School fee accepted. 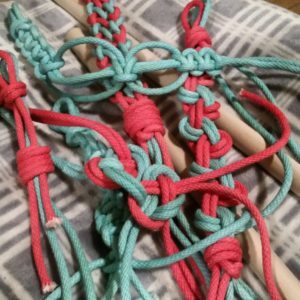 As part of her practice with aceart’s Cartae Open School, Jennifer Ilse Black has been teaching herself a variety of macrame knots. There are lots of great resources for this craft on the web, but it can be frustrating to try to learn from diagrams! Knotting is a tactile art and we learn it best by touch! At this workshop Jen will teach 6 basic macrame knots, giving you the fundamentals needed to make plant hangers, tapestries, and jewelry. Space is limited, so please email jenniferilseblack@gmail.com to claim your spot! This workshop is an opportunity for women, trans people, non-binary people, two spirit people, queer people, and sissies in general to learn basic woodworking skills from and among fellow sissies. – The difference between plywood, MDF, particle board, 2x4s/ beam type wood, and how and when to use these materials for various projects. – How to cut these different kinds of woods with different saws (miter saw, table saw, jigsaw, circular saw, reciprocating saw) for different applications. – How to use fasteners – drill/driver, staple gun, and nail gun. – When you should use screws and when you should use nails. – The magic of wood glue and her friends the clamps. – Safety for your eyes, ears, and hot bod while in the shop. – The knowledge that power tools are super fun and not as hard to use as your dad made them out to be. The workshop will be held in aceartinc’s woodshop. Unfortunately aceart is at the top of a long staircase and is not physically accessible. Space is limited, please email Kelly Campbell at campbell.90204@gmail.com to register. If there is enough interest I intend on holding another, so please let me know if you are interested even if the workshop is full or this date does not work with your schedule. Workshop is free; donations towards Cartae school fee welcome. Does your transcript have large gaps from years of indecisive study and mental health breakdowns? Do you still have a folder on your laptop from when you filed for a F1 Visa and then broke up with your fiancé? No? Well maybe that medical chart, marriage certificate, or tax document holds a story. In any case if you are still reading, this workshop is for you! 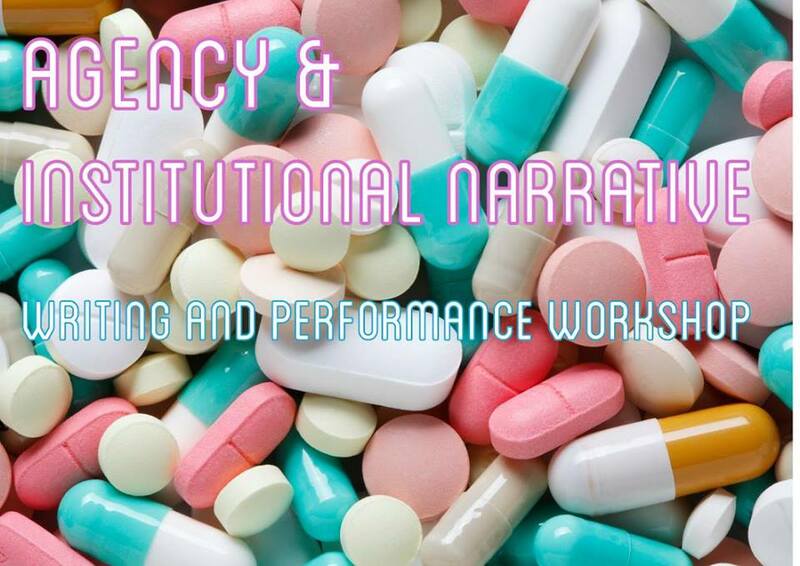 In this workshop you will be crafting your own written narrative or performance piece based on the institutional documents you bring with you. If you’d prefer to work fictionally then bring in some forms from any government or organization website to use as a framework or springboard to craft your narrative. I will introduce some precedents for this practice and show you briefly how I have used it. I will also introduce some tools of oral storytelling. But most of the time will be used for working and optional sharing. BONUS ACTIVITY you will have a chance to take a selfie in front of the luscious pill backdrop used in the image above ^^^^ Fun times for all. Workshop is FREE for all. Donations towards Cartae school fee accepted. Free to ACI Manitoba and aceartinc. members, $25 to non-members. Led by Talia Shaaked | A Cartae Open School workshop | more info here. Led by Beth Schellenberg | A Cartae Open School workshop | more info here. Led by Carol-Ann Bohrn | A Cartae Open School workshop | more info here. Led by Jaz Pop | A Cartae Open School workshop | more info here.